My friend Gina has a blog called Running to the Kichen, and I am always jealous of a) her photography, b) her meals, c) her extreme creativity, and d) her really cool backgrounds. I had the privilege of meeting her at Blend, and love her to death! She recently wrote a post about her special "photoboard" with instructions on how to create your own. I was so excited to try to make one of my own someday (in all my spare time, ha!!). But then I remembered, DUH, I have this really cool red table in my entryway that is being waaaay underutilized and would probably make similarly beautiful photos. This table screams "Pottery Barn" with its bold red color and underlying hues of antique gold and brown. I got it at a flea market... for $25. I've only been to a flea market once in my entire life (4 years ago), but on that special day, I scored this beautiful red table. I also got a cool metal wall plaque for my stairway and a giant (and I mean GIANT) aloe plant. For how successful I was, I'm not sure why I haven't been back. I already made the Blackberry & Basil Grilled cheese last week, but had ghettofied it fairly significantly. So I wanted to attempt a second berry cheese combo, but a bit more sophisticated. Aren't those strawberries lovely on the red table?! With pesto for added protein and flavor, pumpkin seeds for a slight crunch, and balsamic strawberries for a hint of sweetness, this grilled cheese was a winner all around. These finished up just when Dear Hubby walked in the door from work. And I must confess, I got "the look." You might have a similar spousal look of disapproval in your house, but mine had a bit of a sigh associated with it as well... like, "seriously, you made me something weird to eat AGAIN?!" Remember, he likes his food simple and traditional. This was fairly simple, but definitely not traditional! And there was no meat involved... at dinner. Completely sacrilegious in our house! Do you ever get the spousal "look"? Do you ever serve meatless dinners? 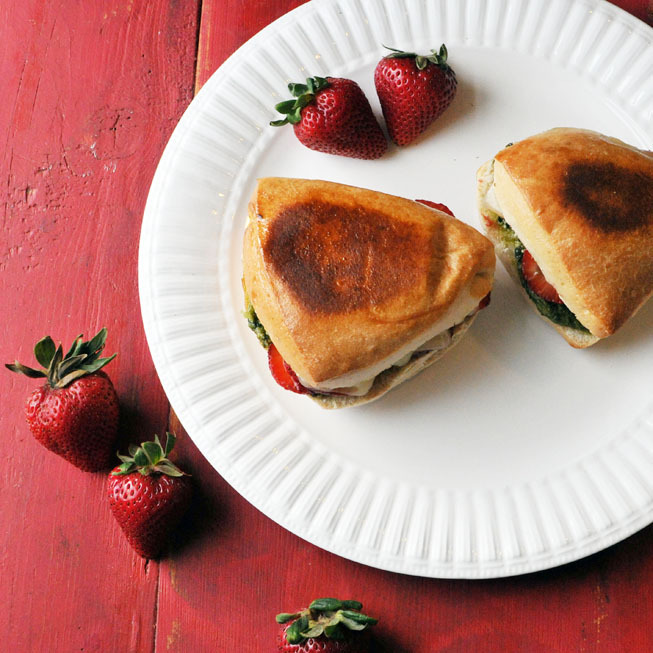 Grilled Cheese made with pesto and strawberries. Slice Ciabatta rolls in half. Spread 1 Tbsp pesto on one side of each sandwich. Sprinkle pumpkin seeds on top of the pesto. Slice fontina cheese & lay on the other side of each sandwich in a single layer. Slice strawberries, then soak with the balsamic vinegar. Stir so that each slice is amptly covered. Layer marinated strawberries on top of the fontina cheese. Use butter or non-stick spray to coat pan. Then, cook over LOW heat for 12 - 15 minutes, flipping halfway through. Make sure cheese is melted and strawberries are heated through. Let cool for a couple minutes so you don't burn your fingers bringing the deliciousness to your mouth!